Our Kids DJ Hire service specializes in creating an immersive music experience. We include a full set of lights, lasers, smoke machines and sound equipment to take your party to the next level. Our local DJs play only the music you like keeping the kids entertained with our party games and dancing competitions. 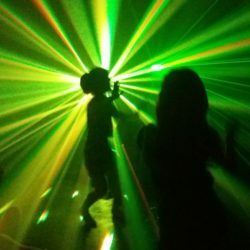 Why Book A Kids DJ? In short, because its awesome. The kids get super excited about our smoke machine, the prizes, the musical statues, the lights, the prizes, the dancing, the games…. you get the point. Booking a DJ gives you peace of mind with the kids and adult entertainment sorted for the evening. Its concise and is a great way for structuring a party if the music stops the party stops which is great when you’ve been running around for the last four hours and would just like a strong cup of tea and a good movie. If you’d like to check out some more reasons for hiring a DJ check out Everything You Need To Know page. We will get your children dancing or we’ll pay you R500. That”s how confident we are. We’re excellent at running party games and interactive dance competitions and can guarantee we’ll have the kids dancing. Here are a couple of videos from some of our latest events. Our full package includes a high quality sound system, full set of LED disco lights, lasers, smoke machine, spinning disco lights, free set up time and transport time within 70 km of Cape Town, Pretoria, Johannesburg and Durban. Optional extras include party games, a projector for photos and unlimited party request. If this is’nt up to scratch give us a call and we’ll tailor a package to your specific requirements. Ensuring you have everything you need for an awesome party.